While I was planning meals for the weekend, I decided that I wanted to roast a chicken with Morrocan flavourings, in a similar way to this leg of lamb. I bought a bulb of fennel, some olives and some preserved lemons and set about putting together said roast chicken. It didn’t take long for me to realise that I was actually just making chicken tagine with a whole chicken instead of pieces. At this point, Stephen and I had a conversation in which he said something like “Shall we just make chicken tagine?” but I stupidly ignored him and continued with my original plan. I should have listened to him. If I had then we would have had a really good chicken tagine instead of a dish which was very much like chicken tagine but not quite as good. 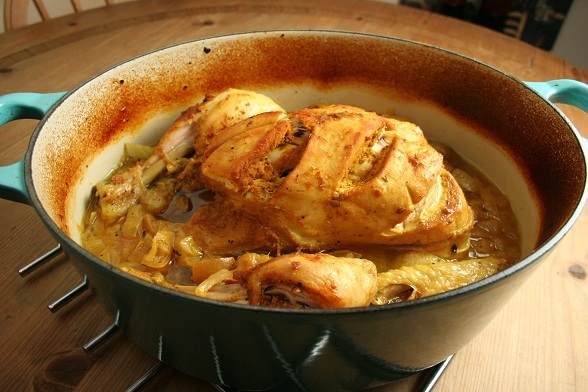 Our chicken tagine recipe is here, try it, it’s brilliant. Subscribe to comments with RSS	or TrackBack to 'Morrocan Roast Chicken'.